Growing up we never, EVER ate Sloppy Joes because my mom didn’t like them which lead me to believe that they weren’t good. Then I got married and my mother-in-law started making them for me which made me realize what I’d been missing all those years. I’ve never had the canned version, but I can imagine homemade is much better. I know our whole family loves this recipe and I love it too because it’s fast and easy. I normally purchase the bulk pack of ground beef and then cook it all at once using this method to stretch it and save money. I love doing this because then I can pre-portion the cooked beef out and either freeze it for later or keep it in the fridge for any recipes that I’m making during the week. Having the beef already cooked makes these Sloppy Joes a super quick meal. Step 1: Brown ground beef. Step 2: Add all other ingredients to beef and mix well. Step 3: Serve on buns. 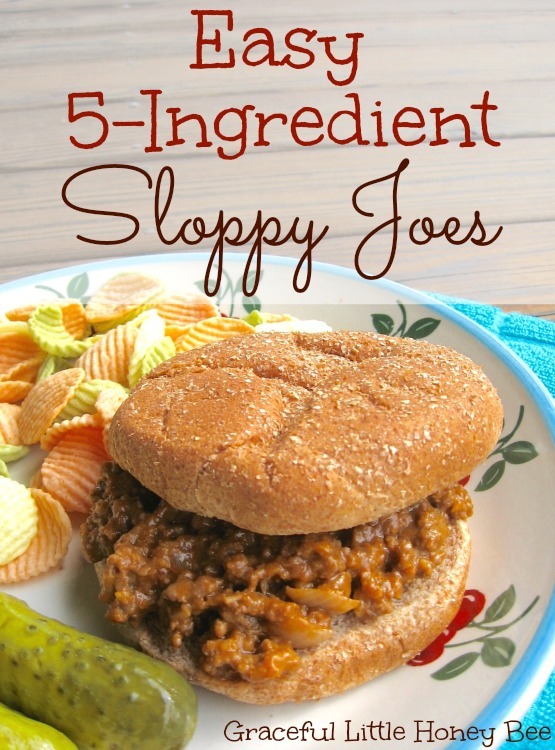 Does your family like Sloppy Joes? I’d love to know! Add all other ingredients to beef and mix well. Thanks for the invite Saira! Sounds delish..I uses to love these as a kid. Now days I will substitute with grass-fed beef or ground turkey. Use fresh tomatoes too. (I always de-seed and cut them up) Much healthier for you. Just have to find meat when it on sale and freeze it like you said. This recipe is delicious & easy. I used ground turkey. We enjoyed it very much!!! I served it on WW organic rolls. I served this with sweet potato fries and YOUR cole slaw. Hubby was happy w the meal. Thank you✌️. I'm Australian and have never before heard of Sloppy Joes. Sounds pretty good but does seem to lack any vegetables. I find quite a few American food/cooking terms either unfamiliar or plain amusing. Enjoy your blog. Hi Pam, I'm not sure where the name for Sloppy Joes came from, but it is kind of odd. You could always add pureed veggies or diced tomatoes to pump up the veggies in the dish. The easiest way is to serve on HOTDOG buns!! So much easier to eat, especially with little kids!